Except that without crew or ammo in the turret what exactly are they hitting? Without crew or ammo or fuel in the turret an enemy tank is firing either a slim dart projectile or a plasma beam generated by a HEAT warhead to make a relatively narrow hole... even if it goes right through the turret... so what? Anything it goes through will be seriously damaged or destroyed... but unless it was the main gun itself it wont effect the performance of the tank or crew. Also in addition to being a larger target it is also a harder target with better protection. Think of a T-90 turret in your head and then take out the crewmen and spare ammo. Think about penetrations from all sorts of angles that go right through. Unless they damage the autoloader or main gun the tank is pretty much still operational. BTW if the tank has UAVs and MMW radar and CM wave radar and Thermal sights using long, medium, and short IR frequencies I kinda think it will be this tank "seeing" you first. When you beef up the armour as much as you can the focus then becomes spotting the enemy at the longest range possible... because most tanks can destroy most other tanks at close range and the best way for tanks to fight is to stand off where their armour will protect them from the enemies fire and fire at their enemy with relative impunity. Well if its a HEAT round it may hit the autoloader or some component that might cause the autoloader or MG to stop. It could also damage the sensitive electronics of CITV or other electronics on top or inside the turret. They need to flatten the turret to keep its profile low. Odds are that targets are detected using a number of sensors and the taking out of one of those sensors will effect performance, but will not take the tank out of action. Its weight is for sure more than 55 tons. Looks ugly and powerful witch makes west seeing it as typical SU design. Hi guys I've got a question, recently there had been a number of images circulating in defense forums about a certain Object 195, now isn't that the T-95 project that just got canceled recently? or is it a totally new design thats being developed for serial production in replacement of the T-90? AbsoluteZero wrote: Hi guys I've got a question, recently there had been a number of images circulating in defense forums about a certain Object 195, now isn't that the T-95 project that just got canceled recently? or is it a totally new design thats being developed for serial production in replacement of the T-90? Object 195 or T-95 project got cancelled last year along with other project. But the chief designer of the tank mentioned that technologies developed and experienced gathered for T-95 will be incorporated in the new tank which is under development. I'm guessing that those recent photos are just from army guys who thought it would be funny to take a picture next to em. Vesti FM asked Igor Korotchenko whether Postnikov’s claim that Russian arms aren’t up to snuff is true. He said there are objective problems with Russian-designed weapons, and some planned for introduction are really obsolete. But, according to Korotchenko, the Defense Ministry’s main criticism is that Russian combat vehicles don’t meet survivability requirements. “Unfortunately, we are encountering unwarranted criticism of the tactical-technical characteristics of Russian military equipment lately. Allegedly, it doesn’t match its international counterparts. One of the goals behind the T-90T is to address the survivability issues already identified.The fact that the Army has been to cheap to pay for the survivability enhancements for the tanks suggests a whole new design is a waste of time because they wont buy that either.ERA is cheap yet Russian tanks went into combat without it in Chechnia in the mid 1990s, or with the blocks fitted but no explosive installed.T-90s are bought but not with their full equipment like Shtora and Arena or Drodz because they say they are too expensive.An M1A2 would be expensive too.As mentioned in your post Austin they designed the T-95 to address the survivability issues raised and the Army called it obsolete.Pretty clear the Army knows more about what it doesn't want than what it does want, and the media is hardly the best method of telling the defence industry what it does or does not want.The Russian industry has worked hard to get export orders in a time when the Russian military has been useless in supporting it financially with little or no orders.All this public whining will only undermine all that hard work and result in a loss of income for the Russian industry.... so who will pay for the next generation of weapons if the exports dry up?The Russian military will pay of course... which means the next gen of weapons will be even more expensive and the Russian Military will have no one to blame but themselves. He says he was personally involved with T-95 and if it got adopted it would have given Russian Army a 20 year advantage over Western system, there were refinments planned for T-95. This tank is discontinued development by Uralvagonzavod in 2010. Its successor is the T-90AM which is a further modernisation of T-90. Uralvagonzavod introduce a new generation of tank T-90AM at the exhibition of arms, which will be held in Nizhny Tagil in the first half of September 2011. On it informs RIA Novosti quoted the press service of the company. URA.RU agency wrote that the new model is a modified version of the tank T-90. According to CEO UralVagonZavod Oleg Sienko, Defense declassifies new car and has already "consented to the passport image. At the September exhibition tank will be shown in action. Sienko also said that the tank was modified based on comments the Defense Ministry. 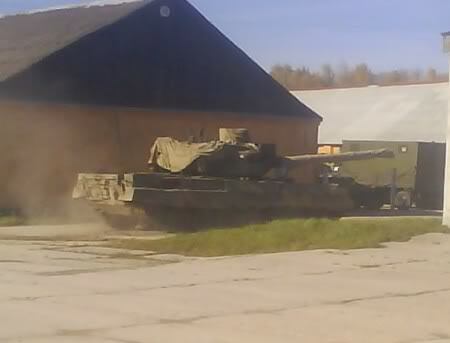 CEO UralVagonZavod said that at a meeting held on 8 December 2009, the military have voiced a number of criticisms of the T-90AM. In particular, they claim, to the engine, transmission, charge, and a host of other things. " Now, the engine became more powerful at 130 horsepower, has changed the barrel, there was a "completely different, secure machine-gun installation. Sienko also said that Uralvagonzavod plans to continue upgrading its other cars, the T-95, though the Defense Ministry in the development of the project is not interested. Back in April 2010 the first deputy defense minister of Russia Vladimir Popovkin said that the agency stopped funding the development of T-95. However, Sienko said that it continues to see in this machine is "more positive than negative." Uralvagonzavod - Russia's largest manufacturer of military equipment and various types of freight cars. Oleg Sienko headed the company since 2009.
continues to see in this machine is "more positive than negative." I suspect that if part of the problem with the T-95 was cost and amount of foreign components that over time such issues will resolve themselves and the domestic electronics industry revives (hopefully), and technology moves forward internally rather than from external to Russia. It is finished taking into account all requirements of the Ministry of Defense, expressed still in December 2009. This is interesting because the MOD criticised the T-90 for still using levers or sticks instead of a steering wheel, and it also criticised the lack of defence from top attack weapons. I guess the above comment means that the T-90AM has new driver controls and defence from top attack weapons... DIRCM? It is clear the Russian Army has decided it does not need or want the T-95. However the technologies developed for the T-95 will likely become part of what ever replaces the T-90, and with the time delay hopefully it will have far more Russian components from hardware to electronics than a T-95 produced right now. It makes sense to get the Army sorted out regarding command and communications etc first before introducing a brand new tank... however if the goal is to protect the crew then the T-95 is still a valid design and I think whatever replaces the T-90 will have a lot in common with the T-95. In practical terms however it seems they have finalised the T-90AM design so hopefully it will go into production next year and existing T-90s will be upgraded to its standard during overhaul/maintainence. That article seems to just outline what we have discussed already. T-72/T-90 was picked over the T-80 because of the expense of the T-80s gas turbine engine (fuel and maintainence), and also because most of the components of the T-80UD.. the diesel model were made in the Ukraine... including the new engine. 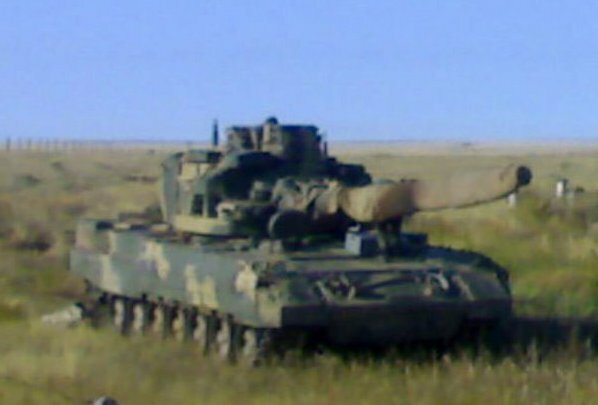 The T-72/T-90 (known in the rest of this post as the T-90) also was found to have better ammo storage in that the stub propellent case is horizontal and inside the armoured autoloader, so when extra ammo is not stored in the crew compartment (as tested in the second chechen conflict) the tanks did not brew up when penetrated. The T-80 almost always brewed up because the stub propellent charges are stored vertically and are exposed. Their caseless design making them horribly vulnerable to heat and sparks and of course fire. The Cold war solution was the T-95 which has since been cancelled. The current situation is that the T-90AM has been developed to fix the obvious faults by adding a turret bustle autoloader to remove ammo from the crew compartment to make it safer. The mention of a 32 round autoloader for the Armata suggests it is derived from the system used in the Black Eagle design which from memory was a 31 round capacity system. So it seems the solution will be a mix of T-90AM and Armata with Armata arriving after 2015. This suggests to me that instead of the old plan of T-90s and with upgraded T-72s in reserve that they will go for T-90s and T-72s in reserve for now but after 2015 they will start making Armatas to replace the T-90s in service with the T-90s replacing the upgraded T-72s in storage. The Armata is a family of vehicles so it will likely take a while to make enough Armata chassis to replace all the T-90s and all the T-90 based vehicles in service like the APC/Artillery/Air Defence/etc. Once that is achieved then they can continue to make Armatas to replace any remaining T-72s and T-90s in the reserve. Indeed it is what we have discussed , I think if all goes well Armata would usher in a revolution in Tank development where new technologies are being tried. So far Russian tank development has taken an evolutionary approach where each version was better then previous in many aspect but it was an improvement keeping within the 40 T limit. Now with Armata they would move to a 50 T tank with a new form of engine for Tanks which is Hybrid Engine and an entirely new crew protection system where crew will be protected by armored capsule and the turret will remain crew less and remotely automated. I think Armata is being developed looking at the next 30 to 50 years life cycle where new technologies development like hybrid engine will evolve and keep getting better. The fire power too could evolve into 140 mm Gun in the future coupled with Anti-Aircraft gun. Is there evidence that it will have an unmanned turret? Personally I think an unmanned turret design is problematic because it crams all the crew into the hull. I rather suspect they will lose the underfloor autoloader which in the Black Eagle added 200mm of vertical height to the turret crew compartment. One of the complaints is lack of internal space so that change alone will increase space without increasing the size of the vehicle. I would expect the first in service Armata tanks will likely have 125mm guns to start off with and have turret bustle auto loaders with the crew completely separated from fuel and ammo. Not carrying extra ammo in the crew compartment allows the crew areas to be enlarged and made more comfortable. Having crew in the turret is not ideal but retains the best situational awareness. The idea of a family of vehicles is very good... if it has electric drive then all of a sudden you can explore all sorts of power generation methods because there is no transmission or gearing... just a complete engine generating power. The only 140mm calibre gun I have heard of is a NATO weapon and I rather doubt they will share that technology with Russia... or if Russia wants to ditch the work it has done itself on its own gun. GarryB wrote: Is there evidence that it will have an unmanned turret? They are certainly talking about crew in armoured capsule and using features of T-95 and Black Eagle in the new tank , the T-95 certainly has isolated the crew from turret. As far as situational awarness goes i think with Panoramic TI ,Gunner TI , perhaps even a small MMW radar and Netcentric Capability that this tank could offer , the awareness should not be a problem. The armored Russian tanks will be the next generation in 2014, announced Saturday the Russian Ministry of Defense. Without specifying the model of the new tanks, the spokesman of the Ministry Lt. Col. Sergei Vlasov told the press that Russia will replace the current group of tanks over a period of six years until 2020. According to Russian media, the new generation of tanks could include two models: T-95 and T-99 , improved models based on T-90. For now, Russian ground forces are equipped with T-72, T-80 and T-90. Interview with Tank-Automotive Directorate of the Ministry of Defence, Major-General Alexander Shevchenko. - Large public interest is a promising family of armored heavy category, developed in the framework of the ROC "Armata". Which car is supposed to create in this platform? To what extent they can be used on developments OCD "Sovershenstovanie-88", 195 object? Technical specification development activities with the code "Armata" provides for the establishment in 2015 unified platform severe category by weight, with a load capacity of 30 tons of gear. As part of the family developed the main tank, infantry fighting vehicle, armored recovery vehicle and the other samples. Platform "Armata" incorporates both the latest design and technological solutions and proven design previously made when an object 195, and in other OCD. In particular, it makes sense to use in future tanks developments OCD "Improved 88" in layout, ballistic protection, power plants and others. For OCD "Breakthrough-2" obtained good results, similar to the requirements of GABTU on fire control system, they can also be used in the "Armata" after appropriate revision. Figuratively speaking, we stand on the shoulders of their predecessors, their achievements are bound to be involved with the use of perspective to create the samples. What machines provided to develop in the middle class? In the medium category by weight being OCD "Kurganets-25" and "Boomerang" with a view to establishing by 2016 a single, unified platform for tracked and wheeled chassis, respectively.In particular, in the interests of the Army to track platform designed infantry fighting vehicle, an armored personnel carrier with increased capacity, armored recovery vehicle. Naturally, the two families to fully meet the requirements of interoperability, integration, intellectualization. What are the prospects for the emergence in the system chassis with armored vehicles elektrodvizheniem? Theoretically, the chassis elektrodvizheniem promises many advantages. However, it is not possible to overcome the technological threshold, which will embody the theoretical advantages in practical solutions. Some key elements of the chassis, especially electric motors, power balancing and regulating equipment, do not meet current and future requirements. - What are the current views of future systems and armored vehicles BAT? Under the leadership of the Minister of Defence, Chief of General Staff, the Deputy Minister of Defence, Main Tank-Automotive team management in conjunction with academic institutions and industry, a lot of work to assess the performance characteristics of military and armored vehicles, and BAT both domestic and foreign production. We visited a lot of armed forces units and specialized enterprises tankoproizvodyaschih major countries, including NATO. Carefully evaluated the experience of combat employment in today's conflicts, identifies prospects, both in combat and technical component. To ensure the required parity in the changed in the XXI century ideology of warfare, there is a need to create the most unified with each other fighting vehicles, allowing for qualitative superiority over the competition. Today we have a clear idea about the role of armored vehicles on the battlefield, it solved the problems of the currently and prospectively. On sound scientific and practical basis formulated the concept of building a unified system of armored vehicles and BAT of the Armed Forces, with the definition of requirements on the range and types of families of vehicles, their combat and operational parameters. - Create a system of maintenance and repair, allowing in the new image of the Armed Forces of the Russian Federation, to be sure that the maintenance of equipment in a combat-ready condition. The system of armored vehicles and BAT based on a single, unified platform for each class of vehicles, differentiated by categories of weight, respectively: heavy, medium and light. A single, unified platform assumes a maximum unification of the chassis, modules, units, nodes, interfaces within the family of vehicles of one category. But this is not enough - we put forward the requirements of unification and between families of different categories. Such unification logically leads to the need for a unified platform with open architecture board. Briefly the requirements for a new generation of armored vehicles and BAT can be characterized by three "I": interoperability, integration, intellectualization. Interoperability - is the operation of the technology for different tasks of the armed forces and arms, their integration into weapons systems, command and control and weapons, without any access restrictions and implementation. Interoperability is a "system of systems" - a set of interconnected public and private systems, which can be integrated to achieve new levels of performance. Integration - a union in the family of various design and technological decisions made under the uniform requirements for the platform, individual combat and support units as units and sites. The common platform with integrated solutions provide multi-modal use and flexible configuration to suit your needs. Intellectualization - is automation and computerization of war, and operational functions to ensure the task as possible exceptions to rights of the algorithms of combat activities and everyday use. Intellectualization is a crucial prerequisite for multifunctional integrated combat systems in the medium and long term, and promises for the future creation of robotic combat systems. For the first time in the history of domestic tank at the same time we launched development activities (R & D) on four key areas of armored vehicles in light of the requirements. К 2015-2016 гг. we should get from the developers of new-generation equipment broad range that covers the needs of the Armed Forces and meets the highest standards of combat and operational performance. Such an approach, without exaggeration, be called revolutionary. Alexander, you mentioned the term "board with an open architecture. Could you explain what this means? This term refers to a platform with interfaces, unified on key parameters - electrical, software, mechanical, weight and size and so on. Within these parameters, you can create functional modules and assemblies for various purposes, which must be installed on any machine within the family, and, in some cases, the machines of other families. It's no secret that we had lagged behind in equipping armored vehicles electronics and computers. The concept of open architecture board requires information integration of functional modules and assemblies based on a single multiplexed bus in onboard information management system. To better understand the wide range of readers of the principle of "the board with an open architecture" will give an analogy with the PC. Housing and board form a platform on the basis of which you can build a computer in a very wide range of performance as a general purpose, and for the solution of targets, such as in computer graphics and mathematical modeling. At the same platform interfaces are standardized, and any expansion device, whether it is RAM module or video card, from any manufacturer from around the world without any problems is integrated into the platform for five minutes. Let me remind you that the world's few manufacturers of chipsets for motherboards and thousands of factories that produce parts for computers. However, computer, assembled from dozens of parts all over the world, it works fine. We want to get close to the level of interoperability in the armored vehicles and BAT. For this purpose, GABTU develop specifications for an open architecture board and by the end of this year will bring them fully up to the enterprises. This is a very important and responsible work, giving the technical specifications in armored vehicles and BAT for many years to come. Its importance can not be overestimated. BTW, I was surfing around and found this photo, which is supposedly of the Manned Ground Vehicle design of the cancelled Future Combat Systems program. Is this similar to the way that the Armata will be used, when it enters service?